Laurel Thank You Cards by Desktop Publishing Supplies are perfect for sending to friends or family after attending your recent graduation or graduation party. 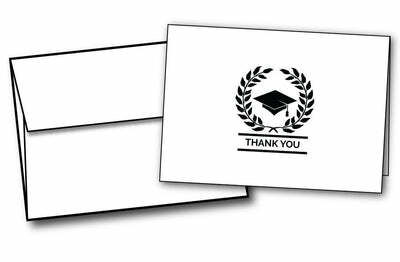 These Grad Thank You Cards feature the words "Thank You" in the classic Collegiate font- Great for anything School related!. These Thank You Cards are made from an 80lb cover cardstock and are packaged flat so you can print on them with your home printer. These cards measure the standard thank you card size of 4 7/8" x 3 3/8" when folded. A matching amount of white gummed square flap envelopes are included!